Mushroom and I are walking past his school on his last day off before term starts. It’s the end of an inset day and the teachers are in their classrooms no doubt preparing for today’s lessons. Mushroom is curious about what he’ll be learning when he goes back and asks if I can see what Miss S (his teacher) is doing. She’s walking between her classroom and the nursery so that tells us nothing. I say I’m sure she has an interesting day planned (and am hoping it’ll be easy going as the kids transition back into their routines). I turn to Mushroom and, knowing that he’s not keen to go back, I think I’ll help him come up with reasons to be happy about returning to school. Me: What are you most looking forward to about school? Seeing your friends? Your teachers? Learning new things? The mud kitchen in the playground *I’m thinking this one has to be a ‘win’*… Or something else..? 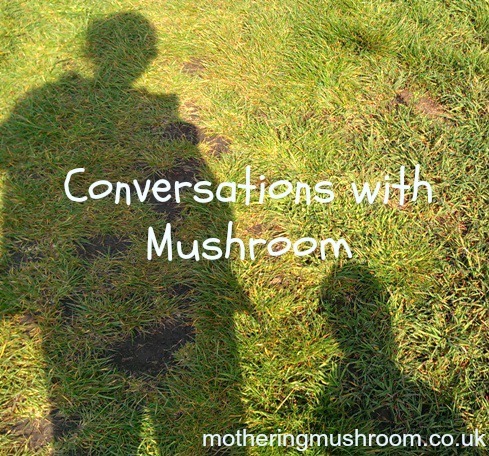 Mushroom: Just hometime and Mummy. Me: Ok. What will you enjoy until hometime..? Did you go back to school/work yesterday? I hope both you and your kids found something positive about it all! Conversations with Mushroom #6: What colour is your finity? Mushroom and I are talking about love and numbers one evening before bedtime. Mushroom: I love you Mummy. Me: I love you too. I love you so much. Mushroom: How much? I love you to 10, 11, 12, 16, 18, 19! Me: I love you much more than that. Mushroom: How much? A really big number? Mushroom: Infinity? Like counting forever and ever and ever? Mushroom: I’m not a baby! Me: Ok. I know, you’re Mushroom. Mushroom, I love you infinity. Mushroom: *smiles, excited* …and I love you to the other finity! The red one! Mushroom: What colour is your finity Mummy? We are half-watching Peppa Pig (again). Mushroom is asking me to re-tell a complicated made-up story about how Peppa took him into the TV and he is ‘Mushroom Pig.’ He stops to watch as Peppa and George are getting ready for bed. Mushroom: Mummy can I have a bunk bed one day? Me: I don’t know Mushroom. Peppa and George share a room so they need two beds that don’t take up much space. There’s just you in your room so you don’t really need a bunk bed, do you? Mushroom: Yes, we could buy me a sister. Me: Um, where do you think we could buy a sister from Mushroom? Me: …and how much do you think we would need? Mushroom: Mummy? Can you make up a story about me and I’m Mushroom Pig? You didn’t finish! This really threw me, as one of Mushroom’s favourite books is Babette Cole’s ‘Mummy Laid an Egg!’ So he knows where babies come from! *If anyone is wondering whether Mushroom is getting a brother or sister, I’ll just refer you to this post, which should cover it.